We anticipate accepting applications this summer from people who are currently licensed as peace officers, or eligible to be licensed as peace officers. 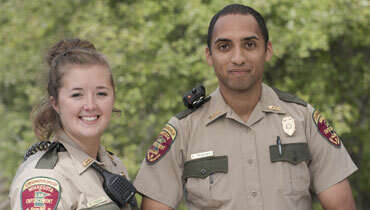 Additional information about becoming a conservation officer. Candidates must pass the general written exam to be admitted to other portions of the exam/selection process. Other portions of the process will include: an oral interview and completion of a comprehensive background investigation. Conditional job offers will be based on passing a medical evaluation, functional capacity exam and psychological evaluation. All notifications will be handled electronically, you must have an updated email address on your resume or you may not be contacted by the DNR. All inquiries should be directed to CO Aaron Kahre.